Guest post from my mom, Laura! The Big Green is a finished, finito, complete, Done Deal! Final dimensions: 5 ft. x 3 ft (1.52 m x 0.91 m). This last session was primarily fine tuning so to speak. Ferny leaf shapes finish the right side now as well as the left. 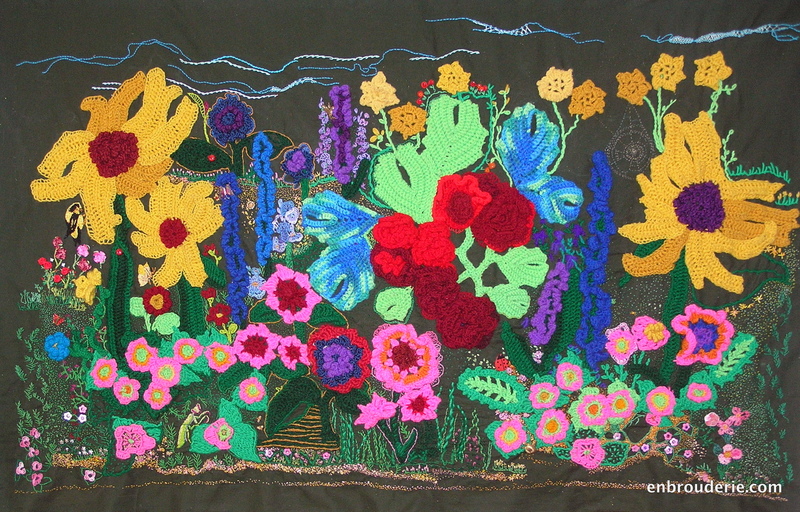 I added more colors to the seed stitching of the background and extended it. This dark green plant has a dark blue and purple flower that blended altogether too well into the background. It succeeded in being inconspicuous. This unacceptable behavior I foiled with a golden stem stitch outline around the entire plant and flower. Finally, many flowers received a sparkle for their center with inexpensive pierced earrings. 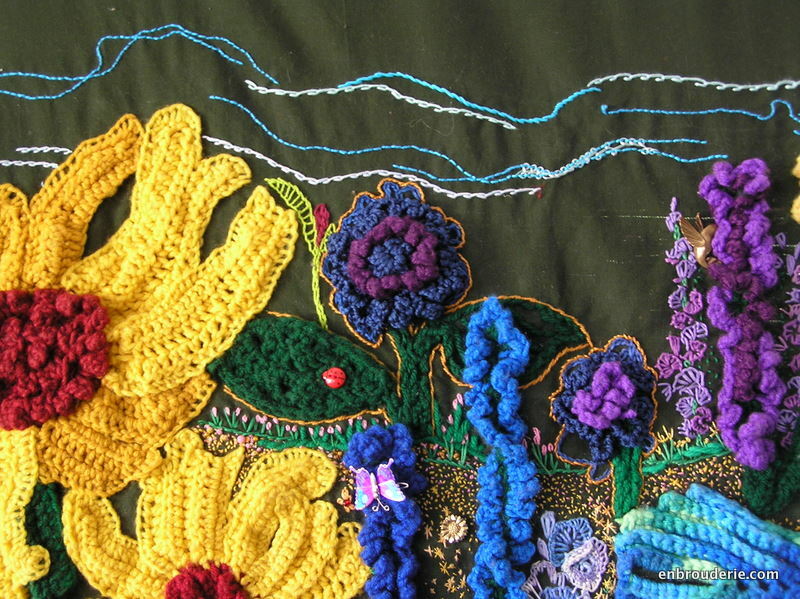 This technique would not work on a quilt (Ouch!) but this Big Green garden is destined for life as a curtain so pointy metal spikes are not an issue. Then at the last, at the very end of things I tried to convince myself that machine stitching the edges (zip and done in 10 minutes max) would not show too much. My artistic sense won out over my lazy streak so I was doomed to hem miles of green. Ghastly, boring, excruciating – It seemed like forever to finish. However, now the Big Green is really truly Finished, Done and even Complete. I DONE DID IT! Celebrate! 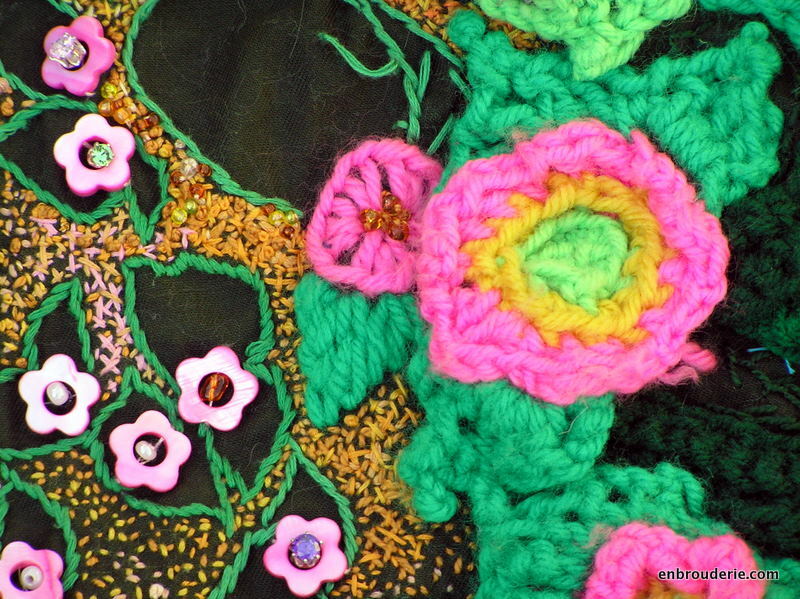 This entry was posted in Mother, Surface embroidery and tagged crochet, embroidery, garden, mixed media, Needlework. Bookmark the permalink. Wonderful and beautiful! I hope when you hang it, you put a sunblocking liner behind it to protect The Green from sun damage! Oh yes. After that much work I would cry to see it fade away. Next? I am working on a beach. Sand, seashells, crabs-lots and lots of crabs. Well done – so satisfying to have it finished, and looking great!